I could say I'm trying to focus on other aspects of the 2016 political scene, like doing my part to stop Communists from getting elected, but who would believe me? Instead, I'm knee-deep in the unexpected sludge of Cruz-Supporter insanity. Cruz Supporter (paraphrasing, since I can't see the comment anymore): Trump is just repeating Cruz's ideas. Me: Cruz should get credit for giving Trump his ideas. As to the "Tea Party," CNN today says Trump and Cruz are almost equal in Tea Party support, at 37% to 34%, respectively. This may come as a surprise to the Cruz supporters, as they have been saying "Cruz is the clear Tea Party favorite." I suspect those who say that either do not know the facts themselves, or assume their audience does not. That is called ignorance, no? Having attended every Tea Party, I consider myself a Tea Partier. Check out my Tea Party videos - March 2009 and April 2009. The best Tea Party videos out there, no? The Tea Party had three principles, and only three principles: Reduced spending, limited govt. and strong national defense. No candidate has ownership of these, and anyone who claims ownership is a fraud. Cruz isn't claiming ownership, but some of his supporters are. This is called desperation, no? Another claim is 'all the horrible Cruz-bashing on social media.' I have not seen any - ANY - of such from my FB account. I did, however, see this today. It is as funny as it has zero chance of changing anybody's vote. If you are upset with this, please speak with the person in the mirror. Trump was just admitted to the Douche Hall of Fame. 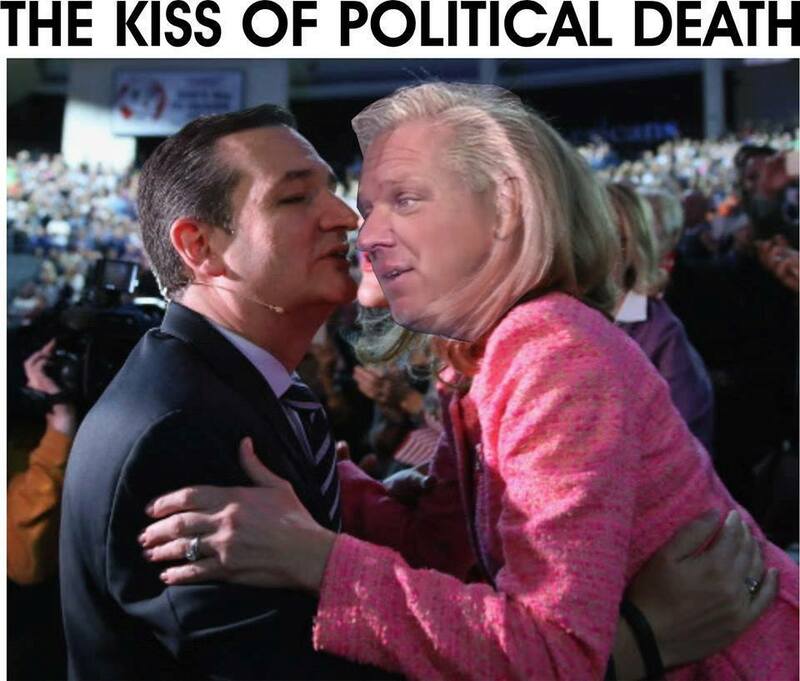 I will keep an eye out for Cruz supporters who denounce Glenn for his lack of judgement. I am disappointed in my fellow conservatives with their attacks on supporters of other candidates. This is the time to tell others the reasons why you're backing GOP Candidate X. After Monday's Iowa Caucus, I think the damage will be done and it will be too late for Cruz supporters to shift into a positive message. Comrade Aaron Clarey (aka Captain Capitalism) gives the old GOPe (Hannity, Beck, Coulter and more) the pink slip in his excellent post, It's 12 O'Clock High for the Traditional Conservative Establishment. The disturbing thing to moi was the rage combined with the unwavering conviction that they were right on every issue and, if you disagree with them, I guarantee they’d spew more F-Bombs in your face than Gary Oldman would if he ran out of espresso and cigarettes. Like the Wild Bill commentary. So true.